Omiya Ardija kicked off their campaign for the 2014 season with an away game against last season's runners-up Yokohama F Marinos at Nissan stadium in Yokohama in Kanagawa just south of the nation's capital, Tokyo on Sunday March 2nd 2014. 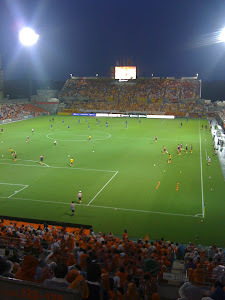 Omiya lost the game 2-0. Yokohama F Marinos opened the scoring with a goal through new signing Jungo Fujimoto in the 17th minute of the first half. The goal was a well taken left footed shot from the edge of the penalty box after a devastating run from Manabu Saito which left defenders in his wake until the final challenge, which rebounded the ball to Fujimoto and he finished. Saito has been a real thorn in the side of Ardija during recent contests. Avery good player whom one wonders if he will get a real chance in the national team. After half time Ardija started to improve but never really threatened the Yokohama goal seriously and Marinos had the better chances including an Ito header off the crossbar from a free kick . The result was put beyond doubt with Ito's 87th minute goal. The ball was cleared by Ardija to the midfield but possession was lost far too easily. From the challenge the ball went straight to Ito and he turned, took a touch and fired in from 30 yards out. A stunning strike to kill the game off. The game finished 2-nil to Yokohama F Marinos. The crowd was 23, 166. The conditions were rainy and wet. It was the first game under a new regime and with some new players in the line up. I don't think it's the right time to panic yet. With Vortis Tokushima and Ventforet Kofu both being thrashed and Vegalta Sendai losing at home 2-1 under a new manager to Albirex Nigata, I think we are already getting a good idea of the teams which we will be competing against to maintain our J1 status. It's early days yet and let us hope that this squad of players can work hard and forge new and succesful partnerships under the leadership of coach Okuma to preserve our treasured position in the top flight of Japanese professional football. The next game on this journey is at home to Nagoya Grampus on Saturday March 8th at 3pm.